1. Psychologically, I feel lazy, fatigued and unmotivated when I don't get enough sleep and that means I'm more likely going to not make it to the gym to work out or I'll be less focused when I get there and won't really do what I set out to do. Energy levels can also be lowered with less sleep and you won't execute your workouts the way you intend for them to be executed. 2. According to an article from the journal "Best Practice and Research: Clinical Endocrinology and Metabolism" in October 2010, not getting enough sleep might cause you to gain weight. According to the article sleep deprivation decreases your body's levels of leptin, a hormone responsible for making you feel full, and not sleeping enough also increases your levels of ghrelin, which increases your appetite and makes you want to eat more. 3. The body releases growth hormones when you sleep which aid in muscle and bone repair. Limiting your sleep can also limit your recovery especially after strength training. 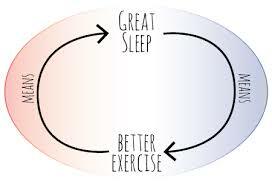 If you want to recover quickly, try to get some good sleep and allow your body to heal itself before stressing it out all over again, allowing for maximum exertion on your next strength training session. 1. We've all had the experience of getting too much sleep and waking up more tired than when we went to bed. This can be a result of the disruption of our circadian rhythm with oversleeping. Our circadian rhythm is the 24 hour cycle driven by our biological clocks that results in physical, mental and behavioral changes. Basically our bodies don't know what time it is and we react as if we have jet lag. 3. Also according to some researchers, too much sleep can have an effect on some neurotransmitters in the brain, specifically serotonin, causing headaches throughout the day. So think about it, if you noticed any of these things are happening to you and affecting your ability to get moving through out the day, it might be time to take a look at what you can do to get just the right amount of sleep. 1. Set an alarm if you are an oversleep and if you are the one who stays up late binge watching Netflix set an alarm to remind you what time you should go to bed. I personally have one on my phone that reminds me when I should start to wind down based on my schedule for the next day. 2. If you keep a normal schedule (an you don't live too high in the northern or too low in the southern hemispheres) sleep when it's dark outside and wake up when the sun comes up. This will help normalize your circadian rhythm. 3. Schedule your sleep. I know it seems a bit funny but schedule your sleep the way you schedule your appointments. Once you have it written down and you see what your habits are, you will have a much easier time adjusting things that need to be changed. .....and on that note, I'm heading to bed! I have an early day tomorrow!